Metals obtained from their oxide ores will tend to revert to that state. However , if on exposure to oxygen the oxide layer is stable , no further oxidation will occur. If it is porous or unstable then no protection is afforded. For hydrogen absorption to occur no oxygen needs to be present, a pH of less than 6.5 and so an excess of free hydrogen ions is required. The Protective film of hydrogen gas on the cathodic surface breaks down as the hydrogen combines and bubbles off as diatomic hydrogen gas. pH between 6- 10, Oxygen present. Leads to pitting. Very troublesome and can be due to ineffective feed treatment prevalent in idle boilers. Once started this type of corrosion cannot be stopped until the rust scab is removed , either by mechanical means or by acid cleaning. One special type is called deposit attack, the area under a deposit being deprived of oxygen become anodic. More common in horizontal than vertical tubing and often associated with condensers. Common in boilers having an open feed system. -Often found in boiler shell at w.l. -In HP blrs found also in screen and generating tubes and in suphtr tubes after priming. Rapid start up and shut down can greatly increase susceptibility. Other possible locations and causes are in grooves along partially full boiler tubes (cracks normally lie at right angle to groove ), at points of intermittent stm blanketing within generating tubes, at oxygen pits in waterline or feed water lines, in welds at slag pockets or points of incomplete fusion , in sootblower lines where vibration stresses are developed , and in blowdown lines. Pure iron grains bound by cementite ( iron carbide). Due to improved water treatment caustic stress- Corrosion cracking ( or caustic embrittlement ) has all but been eliminated. It can however be found in water tubes , suphtr and reheat tubes and in stressed components of the water drum. Boiler steel is sensitive to Na OH , stainless steel is sensitive to NaOH and chlorides. 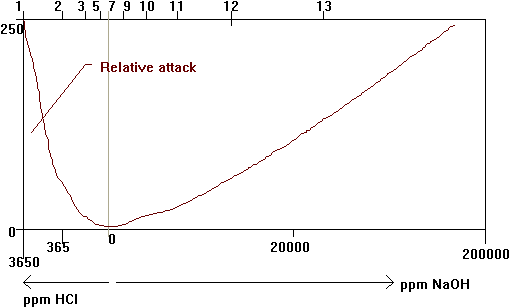 A large scale attack on the material is not normal and indeed uncommon. The combination of NaOH , some soluble silica and a tensile stress is all that is required to form the characteristic intergranular cracks in carbon steel. Concentrations of the corrodent may build up in a similar way to those caustic corrosion i.e. Failure is of the thick walled type regardless of ductility. Whitish highly alkaline deposits or sparkling magnetite may indicate a corrosion sight. To eliminate this problem either the stresses can be removed or the corrodent. The stresses may be hoop stress( temp', pressure) which cannot be avoided bending or residual weld stresses which must be removed in the design/ manufacturing stage. Avoidance of the concentrations of the corrodents is generally the most successful. Avoid DNB , avoid undue deposits prevent leakage of corrodents, prevent carryover. Proper water treatment is essential. · In high temperature, high evaporation rates leading to local concentrations nearly coming out of solution and form a thin film near heating surface. · Local concentrations may cause a significant overall reduction in alkalinity. · If evaporation rate reduced alkalinity restored. Caustic ( or ductile ) gouging refers to the corrosive interaction of concentrated NaOH with a metal to produce distinct hemispherical or elliptical depressions. Depression are often filled with corrosion products that sometimes contain sparkling crystals of magnetite. Iron oxides being amphoteric are susceptible to corrosion by both high and low pH enviroments. High pH substances such as NaOH dissolve the magnetite then attack the iron. Under normal conditions steam bubbles are formed in discrete parts. Boiler water solids develop near the surface . However on departure of the bubble rinsing water flows in and redissolves the soluble solids. However at increased rates the rate of bubble formation may exceed the flow of rinsing water , and at higher still rate, a stable film may occur with corrosion concentrations at the edge of this blanket. 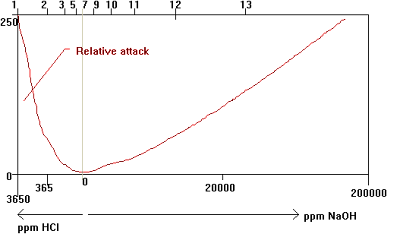 The magnetite layer is then attacked leading to metal loss. The area under the film may be relatively intact. Where a waterline exists corrosives may concentrate at this point by evaporation and corrosion occurs. · Rifling is sometimes fitted to prevent DNB by inducing water swirl. · Prevent creation of waterlines in tubes- slanted or horizontal tubes are particularly susceptible to this at light loads were low water flows allow stm water stratification. If the magnetite layer is broken down by corrosive action, high temperature hydrogen atoms diffuse into the metal, combine with the carbon and form methane. Large CH-3 molecules causes internal stress and cracking along crystal boundaries and sharp sided pits or cracks in tubes appear. more in depth: Generally confined to internal surfaces of water carrying tubes that are actively corroding. Usually occurs in regions of high heat flux, beneath heavy deposits, in slanted and horizontal tubes and in heat regions at or adjacent to backing rings at welds or near devices that disrupt flow . · These micro cracks accumulate reducing tensile stress and leading to a thick walled failure. Sections may be blown out. Concentrated chelants ( i,e. amines and other protecting chemicals) can attack magnetite , stm drum internals most susceptible. Horse shoe shaped contours with comet tails in the direction of the flow may be present. May occur due to heavy salt water contamination or by acids leaching into the system from a demineralisation regeneration. Vigorous acid attack may occur following chemical cleaning . Distinguished from other forms of pitting by its being found on all exposed areas. Very careful monitoring whilst chemical cleaning with the temperature being maintained below the inhibitor breakdown point. Constant testing of dissolved iron and non ferrous content in the cleaning solution should be carried out. After acid cleaning a chelating agent such as phosphoric acid as sometimes used . This helps to prevent surface rusting , The boiler is then flushed with warm water until a neutral solution is obtained. Uncommon in operating boilers but may be found in idle boilers. In an operating boiler firstly the economiser and feed heater are effected. Bare steel coming into contact with oxygenated water will tend to form magnetite with a sound chemical water treatment program. in addition to notes above pH between 6- 10, Oxygen present. Leads to pitting. Very troublesome and can be due to ineffective feed treatment prevalent in idle boilers. Once started this type of corrosion cannot be stopped until the rust scab is removed , either by mechanical means or by acid cleaning. One special type is called pitting were metal below deposits being deprived of oxygen become anodic . More common in horizontal than vertical tubing and often associated with condensers. may be due to mechanical or thermal stressing. During normal operation the environment favours rapid repair of these cracks. However, with high O2 prescience then corrosion may commence before the crack is adequately repaired. Brass with a high zinc content in contact with sea water , corrodes and the copper is redeposited. Inhibitors such as arsenic , antimony or phosphorus can be used , but are ineffective at higher temperatures. Very low sea water flow condensers also susceptible. The copper travels to the boiler and leads to piting.